Some call Alaska the last frontier. Go ride there and you’ll understand why. Alaska is HUGE. This map provides detailed, easy to read information specifically for motorcyclists. The most dramatic sections of paved and dirt roads are highlighted in Butler Maps popular Gold, Red and Orange colors and are accompanied by crucial information about places to eat, sleep, fuel up and cool down. You will also find detailed inset boxes showcasing Alaska’s popular highways as well as roads through Western Canada. This map was produced in conjunction with MotoQuest Tours and is a great supplement to The Adventurous Motorcyclist’s Guide to Alaska by Octane Press. 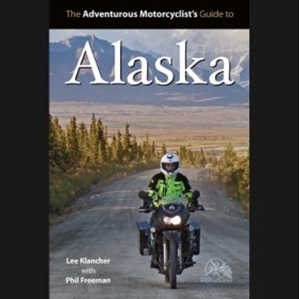 Put one of the most knowledgeable motorcycle tour guides in Alaska in your pocket with this witty, fun book that brings to life the best roads and off-beat destinations in the state. Produced with Motoquest Tours owner Phil Freeman, this complete guide gives you the inside line on the best Alaska has to offer. The book lists all the road routes in Alaska, with maps of the rides with interesting stops and destinations pointed out and discussed. GPS coordinates, websites, and strategies for fuel and lodging are included. Whether you want to tour the state in 100-mile chunks of the worst roads available or gobble up a 500-mile stretch on the way to lunch, Phil Freeman and Lee Klancher deliver the goods with this detailed guide to the wildest state in America.